The all-new 2020 Jeep® Gladiator – the most off-road capable midsize truck ever – has been highly anticipated since its reveal last November at the Los Angeles Auto Show. To celebrate its arrival in Jeep showrooms this spring, a limited-run Jeep Gladiator Launch Edition model will be made available to customers who take advantage of a special one-day-only online preorder opportunity. The unique Jeep Gladiator Launch Edition will only be offered for preorder on Jeep 4x4 Day, April 4, at Jeep.com. The preorder process, including selecting a Jeep Gladiator Launch Edition, estimating trade-in and connecting with dealer, can be completed online through the dedicated Jeep Gladiator Concierge. The all-new Jeep Gladiator Launch Edition will come with unique wheels and interior accents, as well as a "One of 4,190" forged aluminum tailgate badge. The number is a tribute to Toledo, Ohio, and its 419 area code where both Gladiator and the Jeep Wrangler are proudly assembled. Gladiator Launch Edition will be limited to 4,190 units in the U.S.
Consumers who preorder a Jeep Gladiator Launch Edition model will be exclusively eligible to enter the "Find Your Freedom" contest, where they will have the opportunity to win what Gladiator offers: Jeep Freedom. More specifically, they can win one-year's salary of $100,000, so they can take the time off to enjoy the Jeep lifestyle of pursuing any outdoor adventure. To enter, they will submit their personal "Gladiator" video to be judged by the Jeep brand along with wounded warrior and U.S. Army veteran Noah Galloway, who will choose the winner. Consumers can learn more details about the "Find Your Freedom" contest and how to enter by watching this video here, featuring Galloway, filmed at the Toledo Assembly Complex. "The anticipation for the all-new Jeep Gladiator has been tremendous, and to mark the introduction of the first Jeep pickup truck in nearly 30 years, we are offering a distinctive model, a convenient online ordering experience and the opportunity for a very special prize," said Tim Kuniskis, Head of Jeep Brand – North America. "Jeep Gladiator enables the one-of-a-kind Jeep lifestyle. But, to enjoy that lifestyle you need time. 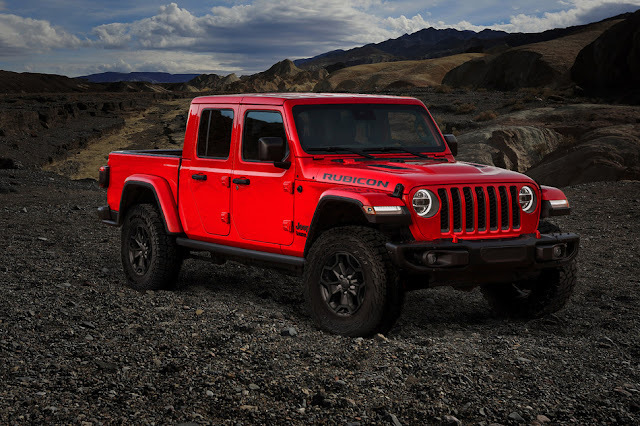 So we're offering that, in the form of one-year's salary, to the winner, so he or she can truly enjoy the outdoors, pursuing any adventure in their all-new Jeep Gladiator Launch Edition." Customers will have the chance to reserve their Jeep Gladiator Launch Edition through an entirely unique online retailing experience. They will be able to go to Jeep.com when orders open April 4 to be connected with a Jeep Gladiator concierge. Customers will enter their contact information and be contacted the same day by the Jeep Gladiator Concierge to assist in completing their purchase. The concierge will pair the customer to a dealer of their choosing to submit their deposit, then finalize the sale and ultimately take delivery. Available in Black, Bright White, Billet Silver Metallic, Firecracker Red and Granite Crystal Metallic, the Jeep Gladiator Launch Edition features a body-color hard top and fender flares. Standard features include LED head and taillights, an 8.4-inch touchscreen, a nine-speaker Alpine premium sound system, keyless entry, Forward Facing TrailCam camera, Blind-spot Monitoring, Rear Cross Path detection, ParkSense rear park assist system, Advanced Brake Assist, Full-Speed Forward Collision Warning Plus, Adaptive Cruise Control with Stop, Trail Rail Cargo Management System, spray-in bedliner and Trailer Tow. Gladiator Rubicon models are capable of towing 7,000 lbs. The all-new 2020 Jeep Gladiator - the most off-road capable midsize truck ever - builds on a rich heritage of tough, dependable Jeep trucks with an unmatched combination of rugged utility, authentic Jeep design, open-air freedom, clever functionality and versatility and best-in-class towing and 4x4 payload. Available with three different powertrain combinations and equipped with a versatile cargo box, Gladiator is built to handle the demands of an active lifestyle while delivering an open-air driving experience in a design that is unmistakably Jeep. Combining traditional Jeep attributes with strong truck credentials, the Jeep Gladiator is a unique vehicle capable of taking passengers and cargo anywhere. A multitude of technology features, such as Apple CarPlay and Android Auto, and safety features, such as Blind-spot Monitoring and Rear Cross Path detection, adaptive cruise control and Forward Collision Warning Plus, further Gladiator's appeal.